The EV and PHEV segments are still the fastest growing in Europe, and the growth rate is even accelerating with sales of full electric cars up 64% and of Plug-in Hybrid cars up 150% on the first quarter of last year. Besides improving sales of most existing electrified vehicles, this is mostly a result of the introduction of new vehicles to these segments. The Nissan Leaf is still the leader of the 100% electric cars, and the first EV ever to sell over 5.000 units in a quarter in Europe. The much more expensive Tesla Model S reclaims the second place it held in Q1 of 2014 before dropping to third in the full year 2014. The Model S had a blockbuster month in March, when it sold a record 2.363 units, and is likely to fall back into fourth place in the next few months, perhaps even as soon as April. The best selling EV newcomer is the Volkswagen e-Golf with over 3.000 sales, or just 2,4% of all Golf sales in Europe. The Golf outsells the Renault Zoe, which continues its strong monthly volume, which has greatly improved since last September for reasons discussed earlier. Behind this top-4, there’s a large gap of more than 2.000 units to the 5th place of the Volkswagen e-Up!, which is surprisingly down harshly on the first quarter of last year. Like its big brother, the electrified version has a take rate of less than 3% for the model. After being in third place last year, the e-Up! is now threatened by the 6th ranked newcomer Nissan e-NV200 Evalia, the MPV version of the Leaf, which has proven very popular among green taxi companies. As a result, the 100% electric NV-200 Evalia outsells the diesel-powered version, a record for cars with an optional electric drivetrain. 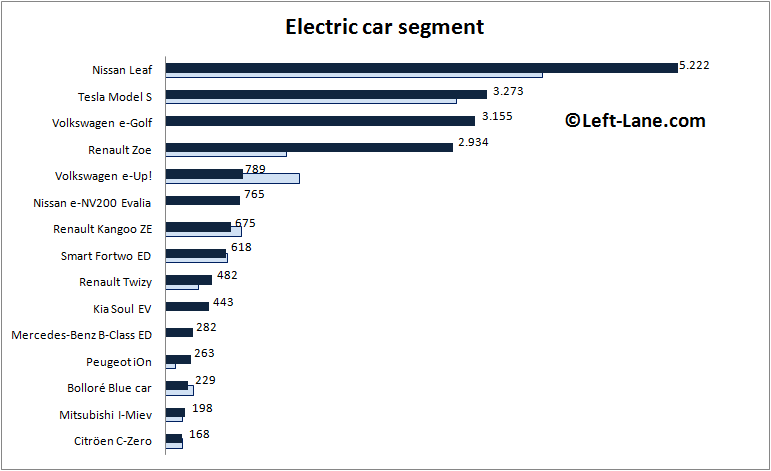 Other newcomers to the EV segment are the Kia Soul EV with a surprisingly high take rate of 13,2% for the electric version, and the Mercedes-Benz B-Class Electric Drive in 11th place with just 282 units. The PHEV segment welcomes four newcomers, of which two immediately enter the top-4, but no player is able to come close to the ultra-dominant Mitsubishi Outlander PHEV, which commands a 44,4% share of the segment with 7.355 sales, an increase of 241% on last year. Almost two thirds of all Outlanders sold in Europe have a power cord, thanks to the successful launch of the PHEV version in the UK, where EVs and PHEVs are subsidized. An upcoming facelift of the Outlander promises to fix one of the biggest issues I have with this car: its incredibly bland styling, so I expect the supremacy of the Mitsubishi in the PHEV segment to continue for a while. The Outlander leaves behind the BMW i3, of which the ratio of pure EV vs. Extended Range EV is not available for 2015. The i3 is stable on last year, with deliveries restricted by supply rather than demand, and despite BMW even shifting some production capacity in favor of the more profitable i8, which has a similar supply “problem”. 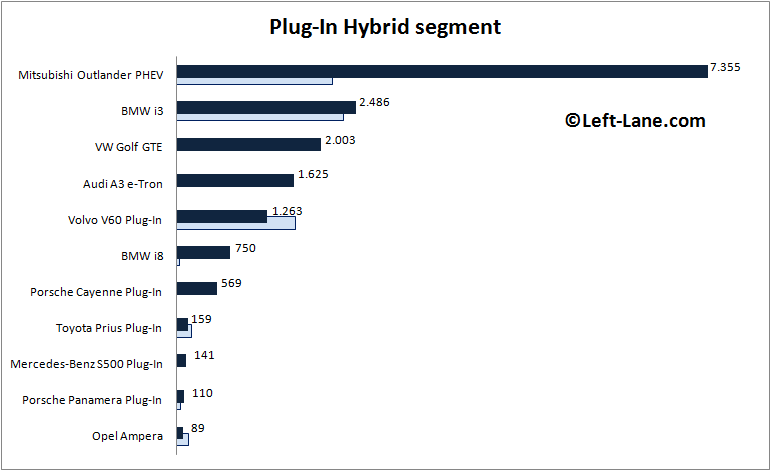 Like in the pure EV segment, the Volkswagen Golf claims a third place with the GTE Plug-in Hybrid, which is actually less popular than the all-electric version, likely because it is more expensive and because some countries only give incentives on pure EVs and not on PHEVs. The Golf’s premium clone Audi A3 e-tron is not far behind in fourth place with double the take-rate of the Plug-In version at 3%. The Volvo V60 D60 AWD Plug-In is down 24% and kicked off the podium, but still well ahead of the BMW i8, which is selling surprisingly well for a model in its price range and with such an extreme design. Click on any model to see its annual sales from 1997-2013 and monthly sales in 2012 and 2013, or use the dropdown menu in the top right of this site. The i3 is a BEV with optional range extender, not a PHEV. this is a sensitive subject, as you could argue where to draw the line between a Plug-in Hybrid and an EV with Range Extender. I agree with you that the i3 without the REx should belong in the EV category, but most of the i3’s sold in Europe are equipped with that optional gasoline engine (no exact data available), and therefore I categorized it as a PHEV. Perhaps other readers could chip in their two cents, so we can see what the general consensus is about the i3.